Construction crews have dug up a section of the Morrisons car park off Kettering Road in the first steps of building the new restaurant. Work crews have moved onto the car park at Morrisons off Kettering Road. 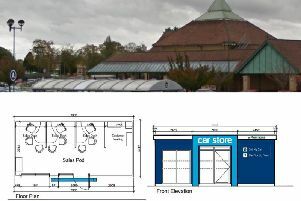 It comes after Northampton Borough Council approved plans to also build a Starbucks drive-thru in the same car park. Construction was due to start in January 2019, but the proposal was held up by a raft of minor changes to the plans. When finished, the restaurant will feature a bike lock up, outdoor playground and will not open between midnight and 6am. Construction has started on a new McDonald's restaurant on the car park of Morrisons in Kettering Road. During the planning stages, nearby residents raised concerns the restaurant would put pressure on traffic and the ability of existing highways to cope. Completion is scheduled for early in the second half of 2019. The new restaurant will be across two storeys. Work crews moved onto the site on March 18.